When I arrived in London in 1984, it was to work in the soft business of Architecture and, for a long while, that’s just how it was. But it happened that the tide quickly turned. That work all dried up and, if you wanted me, in March 1991, I was to be found in a back garden in Queensgate Place, digging my very first hole. I had my pick, my spade and my steel toed boots. I had a big plastic bottle of lemonade and a Mars bar for sustenance. I had my shirt off and the beginnings of a muscle. By noon, I was no longer at surface level but chest deep in the planet.. if I crouched. You might imagine that when an excavation caves it, it would give some prior warning. Not so. My hole fell in on me without so much as a polite cough. One minute I was in it, the next it was on me. I decided it was time for a break. I pulled my tee-shirt over my rippling bicep and quit the site. Once outside, I realised I had left the front door key inside. I was unfazed. Here’s what I worked out. My worksite backed onto a mews house of the kind lately inhabited by unassuming billionaires. If I counted the houses up my street and then counted the mews houses down the next street, I should arrive at the one which backed onto my site. 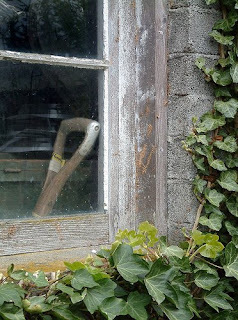 There was a kitchen window which had overlooked my digging, I could use it to climb through. I counted them out and counted them back and arrived at a royal blue door through which television sounds were seeping. I knocked. An Arabian gentleman in full Kuwaiti clothing opened the door and gazed evenly at me. I smiled winningly, his moustache twitched. “I wonder would you mind...,” my little speech was eloquent but obviously in the wrong language. Using an inept charade I managed to gain access to his small but elegant kitchen. There, above the sink, was his rear window and through it, just as I remembered, sat my collapsed dig. The sink was stacked with unwashed dishes. Despairing of any understandable explanation, I proceeded straight away to empty them onto the draining-board. The Arabic gentleman stood back and took this re-arrangement of his domestic affairs silently in his stride. At last the dishes were emptied. Now, finally, I could show him what I was all about. I climbed into his sink, opened his little window and threw myself out of it. I was back inside my own garden! It took me a moment to get my balance. I turned to smile my thanks at this most tolerant of men and there he was, looking more bemused than ever, standing at his open kitchen door. Had I taken more time, I might have noticed there was a kitchen door as well as a kitchen window but, to my lasting regret, I had not. I dug my hole, and it didn’t fall in on me again. And as I packed my things that evening, I could still see the shadowy figure standing quietly in his kitchen recess. No doubt wondering what the hell I had been playing at in his sink. Get out! That's a true story?!? I'd have just crawled into the hole and pulled all the dirt in on myself out of sheer mortification. that you did it is amusing, that you confess this story is hysterical! This is why I love reading your blog. Oh wow, I do hope that's a true story. It makes that whole "bicycle accident" thing seem so much more plausible. Glad you kept all your parts in this one. Is it wrong to laugh at another's misery if the misery comes in the form of a confession? You do make me laugh. I confess might've laughed too hard. I'm sure you'll think of an appropriate penance for that. Fantastic! Do something with it! You really do the world's stereotypical view of the Irish no favours here, do you, son? Very funny! You tell a great story; it had me riveted from start to finish. Hi Carol: All of my more recent stories (last ten years) have at least some shred of truth. Unfortunately this one is *all* true. Howiya Mike: All true but 'negatory' on the truth of the bicycle incident, I invented that one for comic effect! As I was just saying to Debbie, I really wouldn't view this as a confession - I enjoy telling stories against myself. I think I I was inspired to do this by a well-known but most unlikely contemporary British writer who was very good at it himself - I've never named him but I think I might just do that in a post soon. Anyone care to guess who he might be? Dave: thanks, astute as always! This little story has been around the houses quite a bit already - it was my first contribution to RTE Radio's 'Sunday Miscellany' progamme - where I used to read stuff out on the national airwaves - and it was also collected in their 'Best of' book back in 2000. HI Jim, what can I say? I amsk what I amsk (gug gug gug). Jenn - more like grand exit really! I hate to have to tell you this, Ken, but *I* made up the bicycle accident. That's great. That is something I would do. My powers of observation escape me at the most key moments! At least you can laugh at it now. You are laughing, right? Hi, Ken! Due to the pleasure your writing gives to so many, it's won an award. Check out my blog, The Artist's Muse @ http://sharonahar.blogspot.com for the details. Congratulations! 1. Do you read Henson's Hell? This story sounds like something I would expect to see at Henson's blog? 2. You're an architect, right? WHY are YOU digging a hole? Please tell me you're not actually digging the foundation for the building you designed on the job site? As to your other point, it's funny 'cos I was thinking about the background to this story and how topical it is these days. In 1991, construction/architectural work largely dried-up in London so I went to work for one of the building contractors who I used to supervise - I went from turning up in suits on site to being down the hole drenched in sweat and - truth to tell - that whole period remains one of the most satisfying and valuable experiences of my life. Hey, no need to convince me that hard work is valuable. I'm a project manager and work as a river guide. Of course, to me, that's fun--plus my arms and shoulders get bigger. Just curious...91 was a long time ago. I was just coming into my own as a debate coach back in 91. It seems like a whole nother lifetime. I would love to have listened in when the Kuwaiti gentleman told someone what happened, the poor fellow. Enjoyed this story -- I was loosed on the world at about the same time: right when it had tanked. I left college an expert in French Symbolist Poetry to sweep floors in a gay bar for a year. Did you ever finish the hole? he he he,,,hmmmmm.okay..I would be wondering too if I were him. "I don't need a dishwater" I would be muttering to myself. Funny experience Ken, as ever.Keep posting. Hahahaha you are such a Paddy! Only a paddy would be so focused on his task that he would fail to realise there was an easier option all along! Debbie's right - reading your blog is always so rewarding :) You have led an interesting life my dear. I do pitty you with all your mishaps in life. You either find yourself falling off a barb wire fence or being burried in your own hole. However, I'm comforted by your witt. You manage somehow to always take your misadventures in life and inject humour as you write them in your blog. Great post, Ken. Hi Jen, I know that poor man was bemused! The detail I most vividly remember (which didn't quite fit in the story) was a little tv in the kitchen with the One O'Clock News on it. Reggie: Total Paddy!! :) I *have* had a fun life and, please God, I've still got a couple of entertaining pratfalls left in me.